A new hashtag, #SAmbti, was created in the Student Affairs Twitter community this week promoting the discussion of psychological type preferences. Understanding differences of psychological type and how type pertains to personal style and interactions is useful in a variety of work and social situations, but particularly in student affairs, a field that has a strategic service function. The assessment of psychological type is based on the theory that human behavior is not random and that patterns of mental functions exist in the population (Jung, 1971). Put simply, individuals have different motivations and processes for getting through the day, but will follow certain configurations. The 93-item Form M Myers-Briggs Type Indicator® (MBTI®) is the most common instrument for determining psychological type preferences utilized in business, personal coaching and higher education. It asks a series of self-report forced-choice questions to define opposing preferences for personal energy, acquiring information, making decisions, and organizing one’s world (read more on the preferences here). Based upon responses to these questions, an individual is assigned a type preference for each pair of opposites which when combined become one of 16 four-letter type codes. 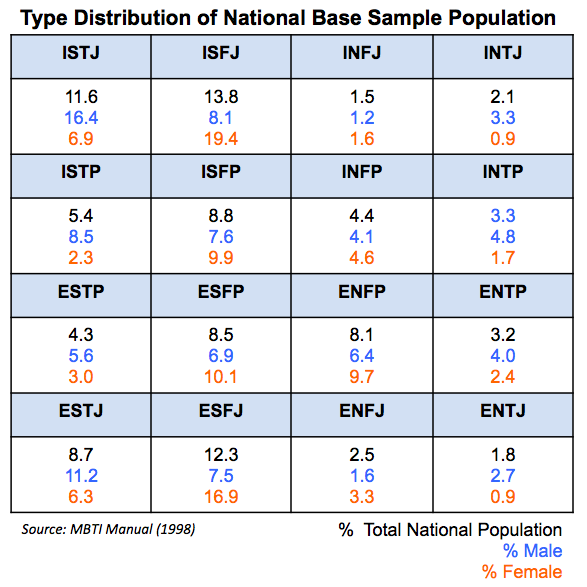 For the stats geeks among us, this type table shows the national sample distribution of type preferences and also male and female percentages of the population. As an ENTJ female, it was reassuring to find that I really do think differently than the rest of the world. This entry was posted in higher education, MBTI, social networks, student affairs, Student Affairs Blog, Twitter and tagged higher ed, MBTI, Student Affairs. Bookmark the permalink.